Counting two successful festivals in Heraklion, Crete, this year the 3rd CommonsFest moves to Athens and will take place 15-17th of May at the Greek Archaeologists Association, Ermou 134, Thisio. For the past few years a particularly dynamic, global Commons movement has been emerging in various aspects of social life. It claims new definitions of value, in both economic and philosophical terms, restructuring the public sphere such that collective action may walk side by side with personal autonomy. The Commons are systems of governance of all that we have inherited or co-produce. They constitute practical cases of collaboration and participation, for the management of various resources, with an aim to satisfy human needs, beyond the mechanisms of state and market. Not only with regard to natural resources, which we are morally obliged to deliver unaltered to future generations, but also with regard to collaborative creations that are common property: from arts, knowledge and science, to software and the Internet. In crisis-hit Greece, the Commons constitute a new organizational and action paradigm, offering inspiration to various groups that are driven to act in a self-organized manner. CommonsFest shows us how we can create the world we want, within the world we want to exceed! The 3rd CommonsFest will host community practices, experiences and artifacts, as well as discussions on how to expand the Commons as a sustainable model for addressing human needs. Participating communities, social movements and emerging social economy stakeholders will explore synergies, enhance networks, and chart a common course towards empowering the Commons. CommonsFest 2015 will also host the founder of the free software movement Richard Stallman, and the economists Massimo de Angelis and Pat Conaty. It will further host 12 workshops and discussions on specialized subjects, such as security and privacy on the Internet, currency reform, urban commons practices and the role of women in the Commons. 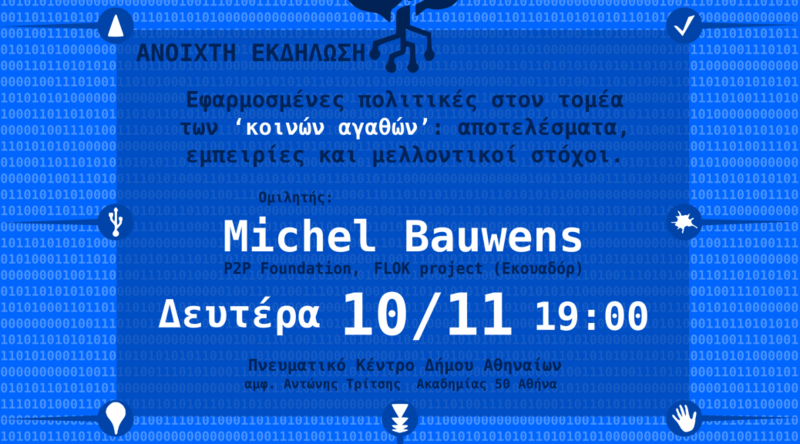 Last, but not least, the Festival will host an exhibition of community artifacts based on open design principles, free software and open knowledge. The festival ends daily with live hip-hop, rock and folk music. Η τηλεόραση ως κοινό αγαθό με τη συμμετοχή της κοινωνίας στο τηλεοπτικό πρόγραμμα και στη λήψη των αποφάσεων. 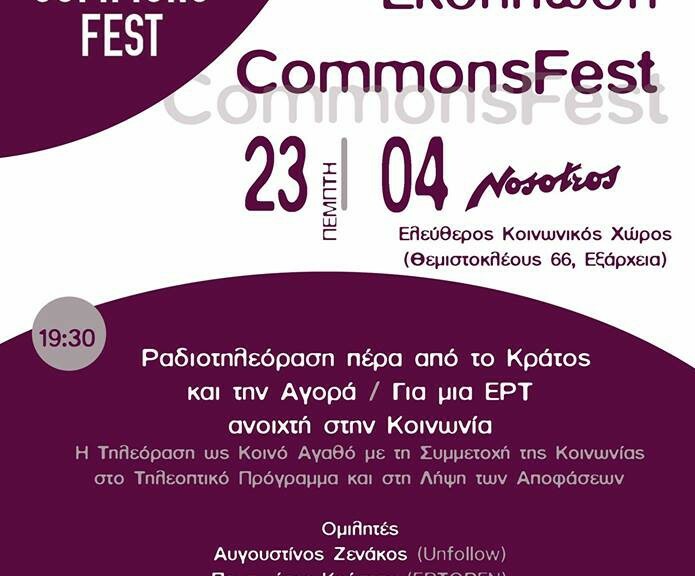 Πάρτυ οικονομικής ενίσχυσης του CommonsFest. Update: The call for talks and workshops is now closed. See you in Athens in May! “At a time when the financial crisis in Greece and elsewhere is reaching a highpoint, the 4th Athens Biennale (AB4) cannot but respond to this bleak situation through a pertinent question: Now what?